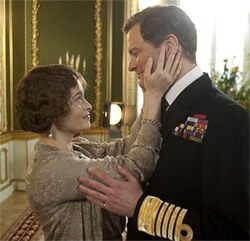 Colin Firth as King George VI in "The King's Speech"
Based on an unproduced play by the same name. Logline: The story of King George VI of Britain — his impromptu ascension to the throne and the speech therapist that helped the unsure monarch become worthy of his crown. — A microphone used for radio broadcasting. A slick announcer warms up his vocals. — The King is waved on and has to give a speech in front of thousands of fans at a sporting event. — The King stammers his way through his speech and we learn that he suffers from a speech impediment. The fans are disappointed in their leader. — The King stutters when he talks. — The King is afraid every time he has to speak to the public. — The King even avoids telling stories to his daughters at bedtime because of his impediment. — The King knows that when his father passes he might one day be leader and would be required to give even more speeches. The King’s older brother (Guy Pearce), who is next in line for the throne, is a drunk and a womanizer and doesn’t seem fit to rule — which puts even more pressure on our King. — The King sees a physician to help him overcome his problems and this results in embarrassment and humiliation. — The King’s wife, Queen Elizabeth (Helena Bonham Carter), is concerned for her husband and starts seeking out other speech doctors. 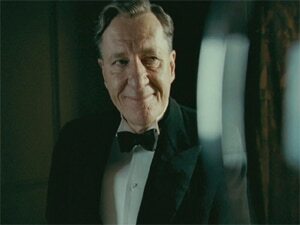 — Meet Lionel Logue (Geoffrey Rush). 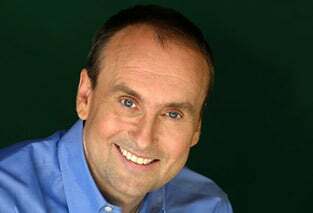 He is an avant-garde speech therapist who also has interest in being a stage actor. — The King’s wife sets up an appointment for her husband to meet with Lionel. — Lionel and the King meet for the first time. — Lionel challenges the King in unorthodox ways. Talks about his personal life. Calls him “Bertie.” And makes him sing. Finally, when Lionel makes the King wear headphones and listen to classical music, then recite Shakespeare, the King storms out, telling Lionel he’s not interested in his services. However, Lionel says the King’s recording of Shakespeare was “stammer-free” and gives the King a recording as evidence. The King walks out nonetheless. This starts the debate. Will the King continue to seek services from Lionel? Will the King allow Lionel to challenge him like he’s never been challenged before? Can Lionel really help the King overcome his impediment if the King returns to resume his therapy? Late one night, in frustration, the King listens to the record that Lionel made of him reciting Shakespeare. To his dismay, there is no stammering or stuttering on the recording. The King knows that whatever Lionel did, it worked — for the first time, he spoke without a stutter. The King and his relationship with his father. King George V’s health is suffering, and he wants George VI to inherit the throne. However it looks like his older brother, Edward VII, is next in line. — The King begins his training with Lionel. — Lionel makes the King do bizarre things, like sit on the floor and yell. And curse. And sing. And anything else to loosen up the King. — The King starts to show improvement. — The King starts to change as a character. — The King starts to change in his marriage. — And Lionel is changing, too. He feels important for once. His wife can hardly believe he’s helping the King. — Things are looking up for the King and we see the beginnings of a friendship between him and Lionel. — King George V falls ill and suddenly passes away. — The throne is not to be inherited by the King, but rather his messed-up older brother, King Edward VII. 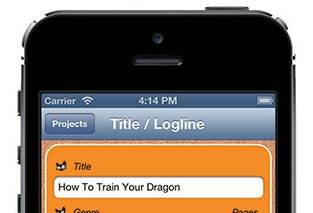 — False Defeat: The King feels like all of his speech training will be wasted. And despite his improvement and authentic ability to be the next king, his older brother will take the throne. Edward VII takes the throne. — The King’s older brother takes the throne. — The King is upset at this. — The King brings his frustration to therapy. — Lionel talks to the King about his father and learns that he was supposed to inherit the throne. — Lionel tells the King that he should challenge his older brother and take over the throne. — The King becomes angry with Lionel, telling him that this is “treason” and he could go to jail just for proposing such a thing. — The King and Lionel’s relationship is tense. — The King stops showing up for therapy. — Lionel worries about the King and goes to see him at the palace. — Lionel waits for the King at the palace but he doesn’t have time to see him. — The separation of Lionel and The King is our ALL IS LOST moment, as this is the central relationship in our movie. This is the A Story with the most heart and emotional impact. It drives our story. When we know the King might be done with Lionel, we immediately fear the worst. — Is their relationship over? — What will happen to the throne? — Will the King challenge his delinquent older brother? — Everything changes when the King’s older brother steps down from the throne. Edward VII has fallen in love with a woman who is not suitable to be Queen, and as a result, he must decide between this relationship and the throne. Edward VII chooses his relationship. Not all is lost, after all. — And now, the King is forced onto the throne. — And into the public light once again. — The King is expected to make a huge commencement speech at his coronation. — The King is panicked. — The King starts questioning himself. — The King no longer has the help of Lionel and becomes afraid. — The King tells his wife in an emotional scene that he’s not supposed to be a leader. His wife tells him that she fell in love with him because of his stammer and knows that he has the makings of a true leader. — The King reconnects with Lionel. — He invites Lionel to the royal coronation and reserves a spot in the royal box seat. — Lionel accepts his invitation. — HOWEVER: The King is furious. His men have researched Lionel’s records and found that he is NOT A TRAINED PHYSICIAN. The King demands an explanation. — Lionel admits that he has no medical training. Lionel is a struggling actor who performs in bars. However, after the war, Lionel started helping soldiers who had Post-Traumatic Stress Disorder overcome their speech impediments using his peculiar knowledge of life and acting. — We’re expecting the King to fire Lionel again. However, there’s change and character growth in our King… and this time he acts differently. He accepts Lionel for who he is. — Lionel and the King begin getting ready for the coronation speech. — The King is ready and shows great improvement. — However, with Hitler’s invasion, Britain declares war, and the King’s coronation speech is canceled. Instead, the King must speak on the radio and project confidence and faith to the millions of Britons who wait in fear and anxiety. — The King declares that he can’t do this. He’s never been able to do something of this magnitude before, and the people will lose trust and faith in him as a leader if he fails. — Lionel promises the King that he can, in fact, prevail. — And Lionel and the King prepare, yet again, for his public address. — The King addresses Britain over the radio. Lionel is in the recording booth with him. — And he’s a success! — He now uses everything that Lionel has taught him, and gets through the speech without stammering. — The King is worthy of the throne. — The King instills confidence and trust in all of Britain. Another home run! Many, many thanks. Cannot wait to see this film. Thanks, Ben. Nice work on the BS2. Glad to see this movie getting award notice. Love those Fools Triumphant! Does this remind anyone else a little bit of Henry Higgins and Eliza Doolittle? Wonderful! The story of King George VI and Queen Elizabeth has always been one of my favorite historicals. I must see this movie. So much attention is paid to Edward VIII and then skipped over to Elizabeth II that people forget how extrordinary it was for this unconfident man to suddenly assume the Throne and then lead his nation through World War II. Incredible. Lady Elizabeth Bowes-lyon knew a winner when she saw one, way before anyone else did. Wonderful beat sheet Ben. Straight spines (did I spell that right) make all the difference in the story. Did the writers use The beat Sheet, or did it just work out that way??? What was the “save the cat” moment????? Joe – We aren’t in touch with the writer; don’t know if he used a beat sheet, but believe the story resonates because he hit the beats. Ben… or any other reader… was there a “save the cat” moment? If the B-story is supposed to show the mirror image of our protagonist, The King’s brother is a great example of that. He’s everything that George isn’t (cocky, self-confident, charming)… at least, until George makes his transformation. Wonderfully structured screenplay here. 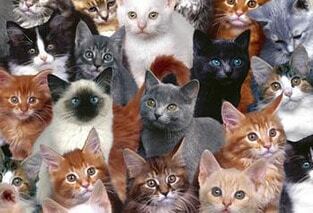 The save the cat moment is when he makes up the fairy story for his children ..the princesses. Sorry Phil…I don’t think so. 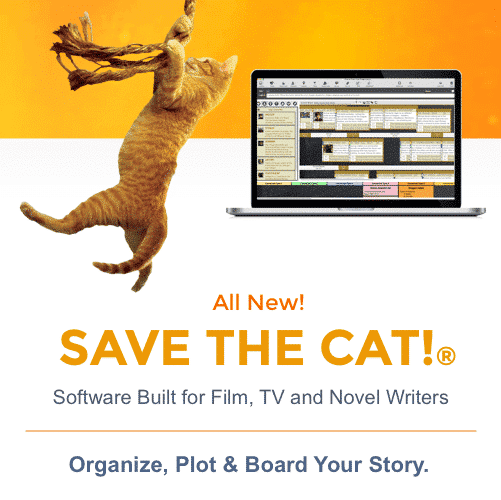 The “Save the Cat” moment should come at the start if the movie and should make us like the protagonist. That scene, with the fairy tale, does not do that. I agree with Phil. 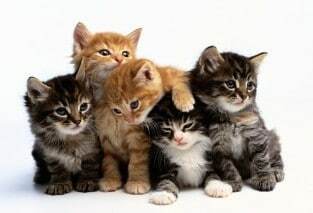 The “Save the Cat” moment is when he tells his children a story. I found the scene immensely endearing. This is a father who rarely tells stories to his daughters because he is so self-conscious of his speech. He hesitates when his daughters beg him to tell a story, and it is clear he does not want to look foolish in front of them. Nevertheless, he overcomes his embarrassment and struggles through a story because he loves his daughters so much. It made me like the King very much. So… was anyone sensing the “Buddy Love” genre here??? I see the “fool triumphant” as well. But, isn’t the “buddy Love” story here much stronger… more prevalent? A HUGE theme in the film is about class and political protocol. Those things stand in the way during the film. One of the first things that Lionel Logue tells the Duke is that they need to see themselves as “equals” in their speech therapy sessions. The only way the Duke can accomplish anything and find it in himself to be King is by identifying Logue (Geoffrey Rush) as a friend. They even have that “All is Lost” moment in the film where they separate. At the end of the film, the King succeeds with his buddy standing a few feet in front of him, encouraging him. What do you think??? 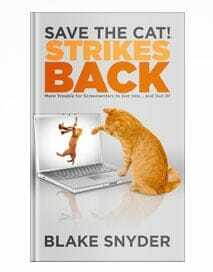 Does our hero need to save the cat in a single moment? And if so, must it necessarily occur in the setup? 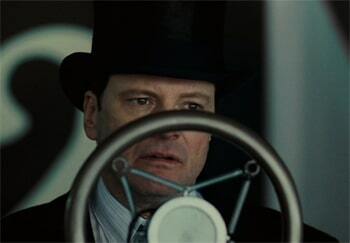 There’s certainly a thematic “Saving the Cat” dynamic in Firth’s treating of Pearce throughout the film. (Picking him up at the plane, coming to get him late for dinner, emotionally bailing him out at the deathbed, etc.) Firth displays a graciousness that Pearce doesn’t have. We feel that he’s relatively more deserving to be King than his brother, which is another reason to cheer him on. I have to agree with Kasiemba here. What the story is “about” is the relationship between Bertie and Lionel. What’s keeping them apart? Class/political protocol like Kasiemba said, but also it is Bertie not wanting Lionel to get too close and really get to the bottom of why he really has a stammer. Lionel is the one who helps him “find his voice” and become a real king, not just the next person in line. Fool triumphants have to do with society not believing in the main character (Legally Blonde, Forrest Gump) and in turn proving them wrong. King George V believed in his son, wanted him to take over the throne instead of Edward, believed he could overcome his stammer. He thought that name-calling and yelling would cure him, which we all know only made it worse. As far as the “Save the Cat” moment, I can’t think of a better example in the movie than the very first scene (more like a “Kill the Cat” moment). When you see him stuttering at Wembley Stadium, you instantly are on his side and want to see him overcome this obstacle. Him being a great father was just an added bonus. We’ve already fallen in love with him by this point. There was no “Save The Cat” moment in the set-up. He does not do anything for another to endear him to us. We connect through sympathy or empathy. I 100% agree with Phil that the “Save the Cat” moment is when the Duke tells his daughters the fairy tale. The fact that it doesn’t “technically” come at the right spot doesn’t lessen its impact as the moment that makes the future king someone you want to root for. The “theme stated” moment comes at the “wrong” spot too. But this excellent beat sheet has still pegged the right moment as that beat. How is the separation of Lionel and the king a false victory in the all is lost moment? Couldn’t you argue that the all is lost moment happens when the king is forced onto the throne? He’s done it! But he’s still not fully prepared for the responsibilities that await him (false victory). He panics/questions himself in the dark night of the soul…but of course, truly prevails in act three after reconnecting with Lionel. At least one film critic has dubbed the film “‘Rocky’ with Royalty”. It’s a movie that follows the basic beat sheet very well, but it blends a lot of the particulars from different genre types. ‘Rocky’ can be regarded as a ‘Sport’s Fleece’ but there are aspects of ‘Fool Triumphant’ in there too. Some stories are stronger because they draw from a wider field and some benefit from being more focused. 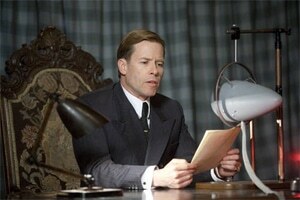 ‘The King’s Speech’ is a wonderful mix. First of all, this David is made king at minute 45, which is a bit early in a 120 minutes film. More importantly though, Bertie does not WANT to be king and his frustration with his brother does not stem from jealousy but from his growing fear that David will not live up to his responsibilities, and thus he, Bertie, will have to step into his shoes. If he was sure David would do his duty, he would be RELIEVED that he himself could stay in the shadows. Becoming King and doing his duty for his country, however, is Bertie’s NEED and the first time he fully acts on that need, is at minute 59 (out of 119 minutes = halfway.) when he confronts his brother at the party and tries to make him see that he cannot both marry Wallis and be the king the people need. Notice that Bertie does not stammer during this confrontation. It’s the hitherto culmination of his growth as a character. The very next moment, however, the bad guys start closing in when David accuses Bertie for wanting the throne for himself. Confronted with the implications of his need, which he doubts he could ever live up to, Bertie starts to stammer again and shrinking back to his old self. 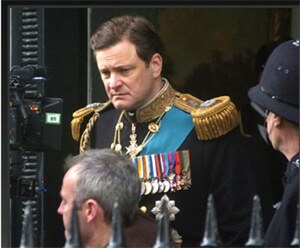 The King’s speech also follows Jeffrey Schneider’s idea of the hero being an orphan, a wanderer, a warrior and a martyr. It’s just mind opening always. You are my most respected and genius Script GURU! Thank you. For me the MIDPOINT is when the King swears in session with Lionel. This is truly “False victory” since the King is able to speak fluently and feeling free, forgetting his constrained self – and we see his potential as he dare to trust Lionel and actually do the loud and “crazy” swearing. – The film is very much about friendship, i think. The scene is basically Lionel holding up a mirror to the King saying/prooving: Yo can do it! And both we as an audience, Lionel, and the King himself believes it – because we see it. The very next scene is the beginning of bad guys closing in: Lionel, full of positive wibe from the swearing-session, pushes the King to believe he can take the throne. But this is a whole nother deal and the King don’t want to hear it, think of it, or Lionel pushing him into believing it. The King ends the therapy sessions.